The Chittoor district of Andhra Pradesh has a long history of drought which has severely impacted the people of the region, mainly farmers with small landholdings. Limited employment opportunities in the rural areas force the able bodied to migrate to towns and cities in search of livelihoods. In this struggle disabled children and aged women become liabilities. Sometimes they are dispossessed and land up as beggars on the streets. It was this disturbing environment that determined the destiny of two dedicated social workers Ms. P. Padmaja (Post Graduate in Psychology and Special Education) and Mr. M. Uday Mohan Reddy. 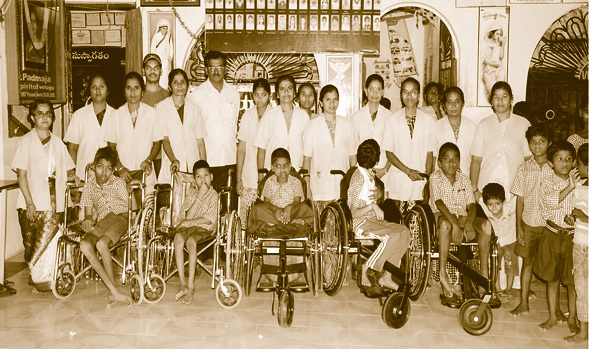 Stricken by the sad condition of differently abled children and destitute women, they embarked on a tough mission, of bringing learning, laughter, love and dignity into helpless lives. Armed with courage and determination, Ms P Padmaja and Mr Uday Mohan Reddy took a pledge to devote their time and meager resources in the service of children in need of special care. 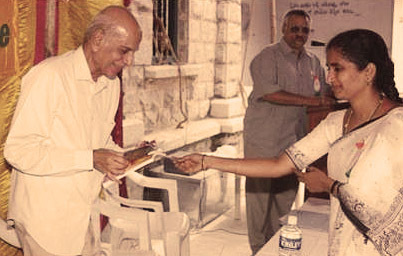 Supported in this endeavour by philanthropist Mr. T. N. Raghunath Reddy and some other individuals, they registered Velugu Service Society on July 7, 1997 at Madanapalle town, Chittoor District, Andhra Pradesh, India. “VELUGU” a Telugu word means “LIGHT” in English. There was not much money available, no great financial support, but nevertheless Velugu school took off, in small rented premises: 15 children with varying developmental disabilities were ‘enrolled’, under the care of a few committed staff. Scores of teething problems followed, but dogged commitment to the cause helped the founders handle each crisis. As the word spread about the school, more families decided to entrust their children to the school’s care – children with cerebral palsy, multiple disabilities, deafness, autism…Before long, local philanthropists and service minded citizens began to come to the school to offer help, in cash or kind. Every little bit was desperately welcome. In 2000, help came their way thanks to their great benefactor and well wisher Late T.N. Raghunatha Reddy. The school, now bursting at the seams, was awarded new and better premises by the famous Annie Besant Trust, Adayar, Chennai. Even as the numbers grew in the school – as well as the pressure of maintaining quality services – Velugu responded to a long and heartfelt social need in 2009. An old age home was started in the same premises for the benefit of another neglected segment of society – destitute women. Faith in humanity was further rewarded with the involvement of another benefactor Mr.Jaybharath Reddy, who was deeply moved by the achievements despite paucity of resources. Through his intervention land was granted by the Government and funds raised for the construction of two well planned buildings, one each for the Home and the School. Though the management goes through a daily struggle to make ends meet, the children and ladies of Velugu are happy, contented and cared for. Many more differently abled children and elderly women await entry. They will be most welcome to Velugu, as soon as space and funds permit.